In the early days of music blogging – which is now more than ten years ago – there was a lightness of touch that has long since disappeared. We blogged simply to share our discoveries and to share our experiences. Music blogging was a forerunner of the sharing economy, a socio-economic ecosystem built around the sharing of human, physical and intellectual resources that later spawned hugely popular innovators such as Uber and Airbnb. But today things are very different and music blogs have transitioned seamlessly from the sharing economy to the me economy. With very few exceptions music blogs and their associated social media feeds are now written with the sole intention of promoting personal careers, and shared discoveries have been replaced by undisguised plugs for personal appearances, performances, recordings and books. This shift from the lightness of sharing to the heaviness of self-interest is usually explained away as an inevitable reflection of changes in the way we communicate. But is it? Is classical music, or any other art form, just about selling? Is it just about bums on seats, reader numbers, and volume of likes and re-tweets? Is it not about building something worthwhile, from which the positive metrics will then flow? In his influential book Peak: How Great Companies Get Their Mojo from Maslow founder of the Joie de Vivre boutique hotel chain Chip Conley talks about wanting his hotel guests to check out feeling “a better version of themselves”. How many musicians, and concert promoters have as their conscious mission for audiences to leave the hall feeling a better version of themselves? How many music writers want their readers to end an article feeling a little wiser? Pioneers of the sharing economy such as Uber and Airbnb are categorised as market disrupters because they overthrow the established order through innovation. It has been said so many times that classical music must change to survive. But where are the disrupters? The last industry-spawned disrupter was Naxos which was founded by Klaus Heymann in 1987. Naxos not only disrupted the CD market with its highly successful budget priced catalogue, but also disrupted the business model of the recording industry by pioneering the use of low-cost offshore orchestras. Not to mention disrupting the cosy relationship between journalists and the classical establishment by successfully suing Norman Lebrecht. Since 1987 the disrupters that have reshaped the classical industry have come from outside; most notably streaming services such as Spotify. In contrast, internal industry forces supported loyally by cohorts of onside journalists - think Sinfini - have all been directed at maintaining the stultifying status quo in the form of more power for the celebrity musicians and their secretive agents, bigger and more expensive vanity concert halls, maintaining profligate funding levels for the privileged few, paying lip service but no more to ethnic diversity etc etc. Classical music can learn a lot from the hospitality industry. Most notably that if you do not innovate and disrupt from within, someone will do it from outside. Classical music has a choice. Start changing the status quo from within. Or watch as a bulldozer forces its way in from outside and reshapes the classical landscape. 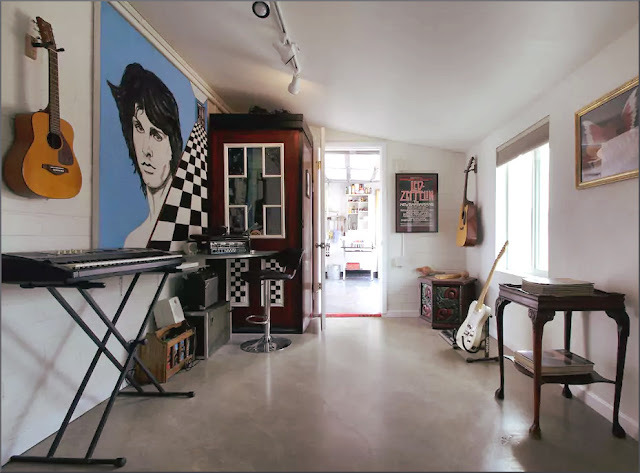 Photo shows Airbnb listed music studio and artist space in Joshua Tree, CA. Any copyrighted material is included as "fair use" for critical analysis only, and will be removed at the request of copyright owner(s). Also on Facebook and Twitter. Unfortunately, just about all classical music CDs exhibit the fact that they have been engineered. By which I mean that the sound is unnatural due to concentration on the electronic manner in which they have been produced rather than natural sound, that can be achieved by avoiding the contemporary approach to recording and CD production. The end result is that however flattering the critics are, concerning this or that CD, I feel that the listener cannot be spiritually satisfied and, therefore, gradually becomes inadvertently disinterested rather than inspired. What an ill-mannered way to turn a well-meaning molehill into a toxic mountain. If the anonymous commenter had taken the time to read the post she/he would understand that it is, in fact, quite a sympathetic take on, ironically, the sharing economy of which Airbnb is a leading exponent. Yes, the post does use a photo from the Airbnb website, the source of which Rubble Ditch would have seen is acknowledged and linked, if she/he had bothered to read the whole post. And yes, there may be a copyright claim against my use of the photo. As stated on the post, ' Any copyrighted material is included as "fair use" for critical analysis only, and will be removed at the request of copyright owner(s)'. But, as the anonymous commenter asks, 'who...are you?'. How do I know that 'Rubble Ditch' owns the copyright of this photo? Googling 'Rubble Ditch' produces no evidence whatsoever that she/he has any connection with an Airbnb property in Joshau tree CA. So how do I know that 'Rubble Ditch' is not one of the increasing number of loonies who roam social media leaving abusive comments – some of who may also manage Airbnb rentals? If the copyright owner of this photo contacts me in a civilised manner and requests its removal with verifiable proof of copyright ownership the image will be removed. The other abusive content in the comment will be ignored, as will the further abusive comments from the same source sent to me which I have not passed for publication. Shame, it looks rather a nice rental and I would have liked to have stayed there. But the claimed owner's idiosyncratic manner with potential guests definitely makes it a definite no-no.